* To the To the Union Left, Stone’s Bde held McPherson’s Railway Cut, supported by a 3-Gun Rifled Battery & a detached Regt from the Iron Bde. * To the Union Right, on Oak Ridge, Baxter’s & Cutler’s Bdes held the ridge, though out of sight. Also supported by 2×3-GunRifled Batteries. A hasty redoubt was also on Oak Ridge. * Paul’s Bde sat on Seminary Ridge in Reserve. * On the Northern edge of the Battlefield were Daniel’s Bde, Carter’s Arty Bde, Iverson’s Bde & O’Neal’s Bde. O’Neal’s Bde is on Oak Hill, opposite Oak Ridge. * O’Neal’s Bde marched in column due south to the bottom of Oak Ridge, Carter’s Arty Bde marched to a gentle hill in the centre & unlimbered, Daniel’s Bde marched up the Mummasburg Rd to support O’Neal, Iverson’s Bde marched & wheeled round the gentle hill. * Stone’s Bde advanced to the southern bank of the Railway cut, supported by the Battery on their Left & Paul’s Bde on their Right. Baxter’s Bde wheeled right to face O’Neal. * O’Neal’s Bde found out the hard way that being in column is good for moving, bad for being shot at. * Iverson’s Bde in column of march got a warm welcome from all 3 Union Batteries & rather rapidly formed line. 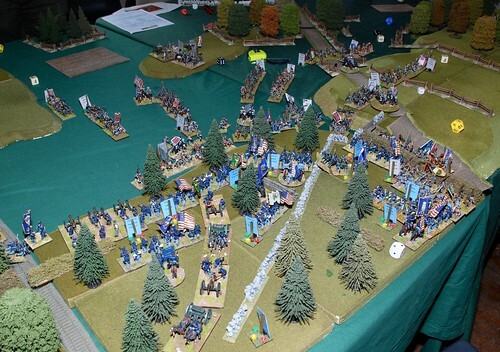 * Daniel’s Bde sent out skirmishers to ping the nearest Union Battery. * Unsurprisingly, the casualties taken from shooting caused a Retreat morale failure on ½ of O’Neal’s Bde. * Ramseur’s Bde arrived with the Corps Commander & another Battery, & endeavoured to catch up the rest of the Division. * Carter’s Artillery began counter-battery fire & scored a palpable hit, blowing up one of the Guns, & causing the Union 1st Division Commander to see the red mist & commit to a one-way charge into the opposing army when he saw his own brother fighting for the enemy. Fortunately, his AdC was the class swot at West Point, & morale improved dramatically! * Daniel’s Bde tried a charge against Cutler’s Bde & stopped under the fusillade of minie balls. * Union Arty returned the favour by KO’ing one of Carter’s Guns & the Battery & Carter himself in one fell swoop. * Stone’s Bde was advancing against the Confederate Artillery. * Confederates finally broke through the Union Right & looked as though they might smash through, but the CSA Right was also hanging in the wind, having only Ramseur’s Bde & the Arty to stop two Union Bdes rolling it up. * So, only a partial victory to the Confederates – Is there going to be a Day 2 of Gettysburg?? * Well done to all the players, hope everyone had fun! The latest version of the rules used can be found [here](/static/RaisingSumterQRSv6_2Feb 2017.pdf). Next month we are all at sea but in reduced circumstances due to the main hall being in use. Previous Previous post: March Big Game: All at sea again!